Puree the liver and cabbage in a food processor and add salt and pepper to taste. Whisk the egg whites. Add the egg whites and yolks and the flour to the liver and bake small pancakes out of this batter. Serve them with sour cream. Mix the soy sauce with the vinegar and pepper and salt to taste. 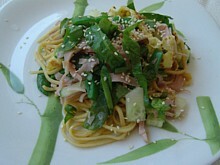 Mix the noodles with the cucumber, the string beans, the spinach, the pepper, the ham and the eggs and stir well. Pour the soy sauce mixture over the noodles and sprinkle with sesame seed.